Richard E. Mayer presents an example of how using words and images is more effective than using words alone. 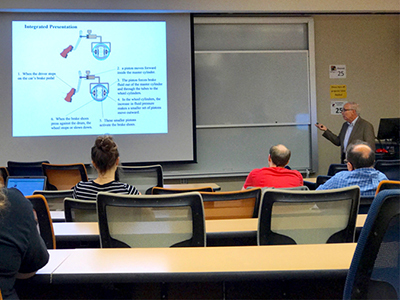 On October 19, Miami alum and world-renowned educational psychologist Richard E. Mayer returned to campus to give a psychology colloquium on multimedia learning and how knowledge can be transferred to new situations. "Being able to apply what you learn and transfer what you learn is the goal of education," Mayer told his audience. "'How can we do that?' is the question that has driven my research." Mayer graduated from Miami in 1969 with a B.A. in psychology and then received his PhD at the University of Michigan. Now a Distinguished Professor in the Department of Psychological and Brain Sciences at the University of California, Santa Barbara, he is also the author of more than 500 publications, including 30 books. Mayer's research interests are in applying the science of learning to education, with a focus on how to help people learn in ways so they can transfer what they have learned to new and different contexts. He spent the last couple of decades learning how to design instructional messages that use principles involving words and graphics to help people better understand those messages. During the Tuesday afternoon colloquium, Mayer focused on how multimedia learning can help people learn to apply their knowledge in new areas. Multimedia learning involves both words (printed or spoken text) and pictures (animation, video, illustrations, or photos). "My work in multimedia learning helps me examine how people learn scientific explanations from computer-based animation, video, and narration," Mayer said. "I also look at how illustrations affect how people learn from scientific text, or how people learn to solve problems from interactive simulations." The purpose of multimedia learning is simple, he added: people learn better from words and pictures than from words alone. One of Mayer's graphics in his presentation represented his spatial continuity principle, depicted as an integrated presentation in which the words are placed near the graphic. He explained that this principle reduces extraneous processing, which is "cognitive processing that does not support the objective of the lesson and is caused by poor instructional design." Multimedia learning works through instructional goals, which aim to generate messages that allow students to experience meaningful learning. "For example, instructors tend to put way too much information in their textbooks, which does not allow students to learn as deeply," Mayer said. "Things should only be as simple as you need." The colloquium was well received by the attentive audience. "Dr. Mayer is a tremendously successful alum, so it was a huge opportunity to hear him speak," said Christopher Wolfe, psychology graduate director and professor. "We're all here to learn, both faculty and students, and anytime you can get insight into the learning process is a worthwhile experience." "It became apparent to me that the way we communicate information is going to be very critical going forward," said graduate brain, cognitive, and development psychology student Mitchell Dandignac. "Knowing this builds a sense of accountability for instructors, not just students." As he continues teaching, conducting research, and engaging in professional service, Mayer offered some advice to Miami students: "Find an environment where you can thrive and surround yourself with people who appreciate you," he said. "Always remember that your most important asset is your sense of personal integrity."